Kiteforum.com with support of ABoards Kiteboarding has launched a new snowkite location contest. To view snowkite locations, go to www.kitebeaches.com and click on the tab “Snowkite” and then all snowkite locations can be found. Then click on “Add Location” and the snowkite form will be shown. Everyone who enters a new snowkite location to http://www.kitebeaches.com will be entering the contest! Make sure to log onto KB and then add the location, this way we can see your username. In about 2 months we will draw a winner for the prizes! Snow kite board 2009/2010 differs from previous year’s model. More attention has been paid to outline, core, top and bottom sheets in order to construct a board that will fit for freestyle/freeride riding. The new board range has a dynamic radius in a range of 8-9m, which allows the board to have great maneuverability, easy jibing and performance of freestyle moves in contrast to race type boards. The new board has balanced flex to ensure good pop and pleasant landings, however in central part of the board along both edges there are special stringers embedded into the core so that the board can keep the grip on the edge at higher speeds and loads while riding with kite. The board has special base cover to withstand high loads. Top sheet is from new type of glossy material to ensure excellent look and durability. All boards have transparent technology window on top where core is visible. Core is mixed type wood and stringers. Waist parameters: 147cm (252mm), 155cm (258mm), 158cm (264mm). Stance width 52-68cm. Snowkiting video from Chamonix, France. Rider Thomas Ligonnet. Board from ABoards Kiteboarding for freeride/freestyle snowkiting. 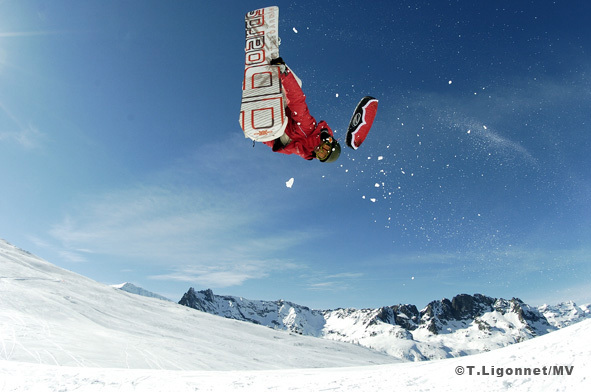 Excellent maneuverability of the board allows it to be well-used also as a snowboard without a kite.